When I hear the word stash my mind immediately goes to the large piles of fabric hidden away in my craft closet. Ahh, sweet love. I'm addicted to fabric. But lately, when I hear stash my mind has been jumping to another version of the word. The STACHE. I'd say it's because of Detective Stark from The Good Guys. But it's so not. Although he had me laughing while saying things like "smarty-phones" and "CSI stuff is like black magic." NO, he's not the reason I'm thinking of the Stache. This post is. I've been reading Cheri's I am Momma Hear Me Roar for some time now. I've even used one of her great ideas before. But this, this is too cute. A Little Man Tea Party is one of her latest awesome ideas she used as an entry in So You Think You're Crafty. I saw this post and just new I had to have this party. And I'm already planning it. 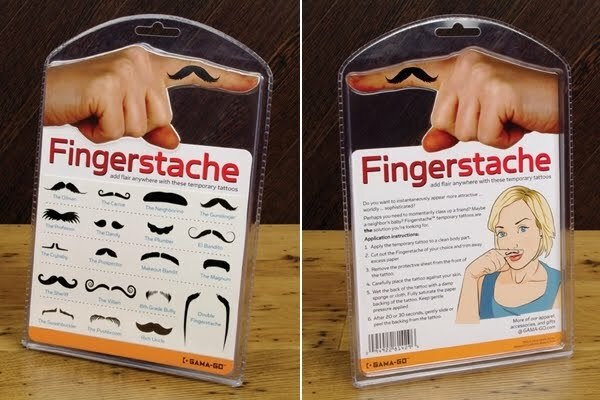 In the mall the other day I found Finger Staches . So I picked up them and some other adhesive ones in preparation. I've already got invitation designs in mind. I can't wait to share the pictures with you and tell you all about it! Have I mentioned lately how much I love being a mother of boys? It's awesome! oh my gosh, how funny! I can't wait to see pictures!! I absolutely love the chocolate stache's on the plates! It gonna be great, I can tell. Thank you for commenting on bugaboo, mini, mr & me!